BUTLINCAT's BLOG: Fearing Death, WikiLeaks Julian Assange Releases Password to Large Cache of Hillary Files! You can bet after the news of the Russian-Clinton-Obama collusion broke on Tuesday about all the extortion, bribery and money laundering, that WikiLeaks founder Julian Assange is feeling a little bit edgy. 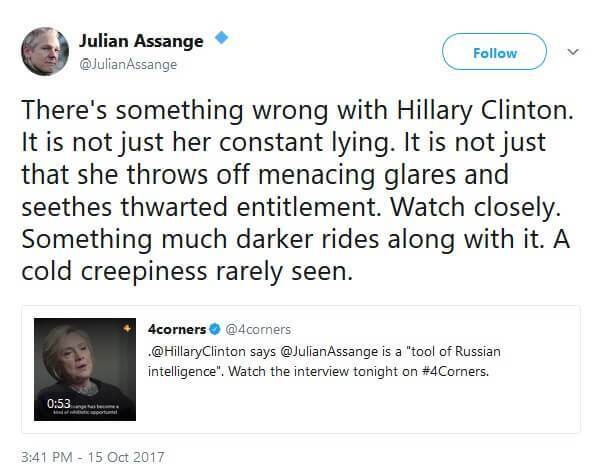 Afterall, Assange has been telling Americans for years Hillary Clinton was corrupt and evil, and colluded with the Russians. Too bad not many Americans listened. Now more truth is coming out and Wikileaks Assange was right all along! It’s suspected that Hillary Clinton could be on the verge of being totally exposed by the release of more compromising and revealing files held by WikiLeaks, based upon the recent posting of a rather cryptic set of letters and numbers on Twitter by founder Julian Assange. Clinton was recently in Australia to promote her book “What Happened?” about the 2016 election, and reiterated her belief that WikiLeaks and Assange — who she termed a “nihilistic opportunist who does the bidding of a dictator,” according to the International Business Times — were in league with Russia and partially to blame for her electoral loss. Assange replied via Twitter, “WikiLeaks has a pristine record for accuracy. HRC is not a credible person. The primary cause of her downfall was her own Machiavellian scheme to elevate Mr. Trump (‘Pied Piper’).” The tweet contained a link to Clinton’s interview as well as a link to latest WikiLeaks dump exposing Russian interests. Less than 20 minutes later, Assange then tweeted what many believe is an encryption code or “dead man’s switch” that would ensure the release of certain files by third parties — or even automatically by a computer program — in the event of his being detained or killed prior to his own determination of when to release such files. About an hour and a half later, Assange posted one more tweet regarding Clinton that some suspect hinted at what the prior encryption code could be the key to unlock. “There’s something wrong with Hillary Clinton. It is not just her constant lying. It is not just that she throws off menacing glares and seethes thwarted entitlement. Watch closely. Something much darker rides along with it. A cold creepiness rarely seen,” Assange tweeted. Of course, the posting of an encryption code that could possibly unlock secret files revealing damning information about Hillary Clinton has fueled conspiracies, but the IB Times noted that Assange has posted such encryption codes several times in the past as a sort of “insurance” safeguard prior to a massive document dump. Interestingly, a site known as The Duran documented a series of tweets from Fox News host Sean Hannity in reference to Assange, most notably one a week prior to Assange’s cryptic tweet that read, “T minus 7 and counting. Tick, tock” — quite possibly a knowing reference to an upcoming document dump. OF COURSE, WE ALL KNOW WHO HILLARY CINTON HATES THE MOST NEXT TO DONALD TRUMP AND THAT’S WIKILEAKS. AFTERALL, IT WAS WIKILEAKS THAT EXPOSED MOST OF HER CORRUPTION TO THE PUBLIC. EVEN THOUGH, IF YOU ASKED HILLARY CLINTON SHE WOULD INSIST THAT WIKILEAKS IS NOTHING MORE THAN PROPAGANDA BACKED BY THE RUSSIANS TO MAKE HER LOOK BAD. Hillary Clinton is such a pathetic liar!!!!! Hillary and the Democrats used this whole Russian propaganda and all the fake news of the Russia-Trump collusion to deflect away from the real truth about the REAL Russia-Obama-Clinton-Mueller (and several others) collusion. Pretty sad that all of these Democrats would put money over America’s own national security. That’s the real and sick truth! There is so just much disgusting swamp to drain in Washington, DC. President Trump can’t do it alone. The sad part is…this swamp isn’t just filled with Democrats. Republicans are just as guilty. Speaking of guilty….when are the real criminals going to pay the price? From Hillary Clinton and her pay-to-play scandals to the Uranium One deal, someone needs to pay the price, other than the American taxpayers. How does Hillary Clinton continue to be involved in these enormous crimes and NOTHING happens? It’s one filthy deal after another. My gut tells me that until Trump can clean out the ‘Obama leftovers’ there will continue to be members of the swamp in his own administration. The drain is backed up and clogged with DemocRATS. It’s time to drain the swamp. In the meantime, I would look for another WikiLeaks dump by Julian Assange to come very soon with more revealing Clinton documents.There are still thousands of deleted emails from Clinton’s private server that she refused to turn over to investigators that Assange could choose from. Let’s hope he let’s it all out. You can bet that Hillary Cinton isn’t going to like it at all. Knowing her she is thinking of ways to stop more of the truth coming out from WikiLeaks founder Julian Assange. Let’s hope Assange can stay safe. Lord knows Hillary Clinton has a long enough trail of bodies just in the past year…..from Shawn Lucas, to Seth Rich, Bernie Whisenant, Molly Macauley and others. We also know she already threatened to take Julian Assange out with a drone. It’s time to put a stop to the Clinton corruption, don’t you think? Maybe THIS was the ‘calm before the storm’ that Trump was referring to. We’ll all know soon enough. Tighten your belt folks…things are about to get interesting real soon…. just in time for Christmas! THE MOST TREASONOUS WOMAN IN AMERICA JUST GOT WHAT HAS BEEN COMING TO HER FOR DECADES. According to American News, Raso began by calling Clinton out for a lie she told an audience “in order to make herself appear as courageous as American soldiers.” Of course, he was referring to the lie Clinton told about dodging enemy fire in Bosnia.